May 24, 2015 – The International Space Station Program will take the next step in expanding a robust commercial market in low-Earth orbit when work continues Wednesday, May 27, to prepare the orbiting laboratory for the future arrival of U.S. commercial crew and cargo vehicles. NASA Television will provide live coverage of the activity beginning at 6 a.m. MDT. NASA is in the process of reconfiguring the station to create primary and back up docking ports for U.S. commercial crew spacecraft currently in development by Boeing and SpaceX to once again transport astronauts from U.S. soil to the space station and back beginning in 2017. The primary and backup docking ports also will be reconfigured for U.S. commercial spacecraft delivering research, supplies and cargo for the crew. On Wednesday, robotics flight controllers at the Mission Control Center at NASA’s Johnson Space Center in Houston will detach the large Permanent Multipurpose Module (PMM), used as a supply depot on the orbital laboratory, from the Earth-facing port of the Unity module and robotically relocate it to the forward port of the Tranquility module. This move will clear the Unity port for its conversion into the spare berthing location for U.S. cargo spacecraft; the Earth-facing port on Harmony is the primary docking location. 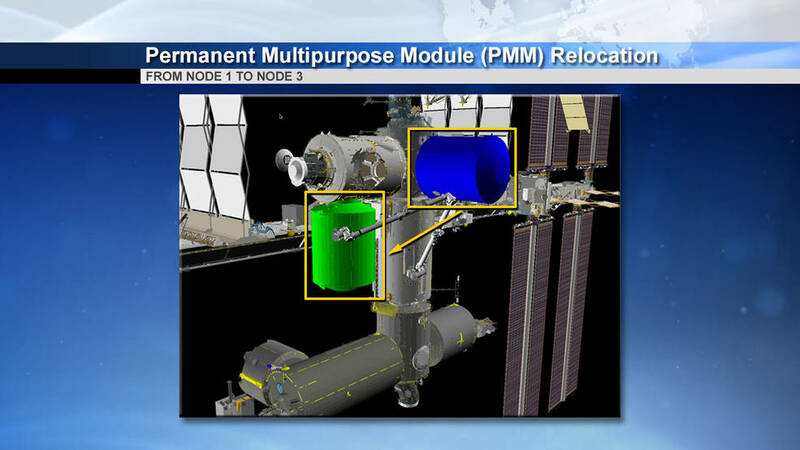 Harmony’s space-facing port currently is the spare berthing location for cargo vehicles, so this move frees that location to be used in conjunction with Harmony’s forward port as the arrival locations for commercial crew spacecraft. Before broadcasting the final movements and installation, NASA TV will replay the operations conducted earlier in the day to detach the PMM from Unity and move it toward Tranquility. Expedition 43 Commander Terry Virts and Flight Engineer Scott Kelly of NASA will supervise the unbolting of the module from Unity and its final attachment to Tranquility. Virts and Kelly will close the hatch to the module on Tuesday, May 26, and reopen it at its new location on Thursday, May 28. The transformation of Harmony’s space-facing and forward ports for crew arrivals will continue later this year, when a pair of International Docking Adapters (IDAs) will be delivered on the seventh and ninth NASA-contracted SpaceX cargo resupply missions. The IDAs will be attached to Pressurized Mating Adapters 2 and 3, which enable the spacecraft to equalize internal pressure with the ISS. The PMM, originally named “Leonardo” by the Italian Space Agency that supervised its manufacture, was one of three cargo modules used to haul supplies back and forth from the station during space shuttle assembly missions. The PMM was launched for the last time to the station on the final flight of the shuttle Discovery on February 24, 2011, and was installed on Unity five days later. The PMM is 22 feet long, 14 feet in diameter and weighs almost 11 tons. It has an internal volume of more than 2,400 cubic feet.